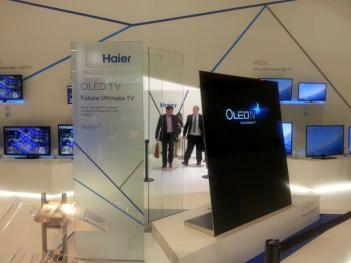 I do not know who makes the actual OLED panels, but my bet would be on LG Display. The company's flat OLED panel is 4 mm thick and in addition we know that LGD are interested in supplying OLED panels to other companies (besides LG Electronics). 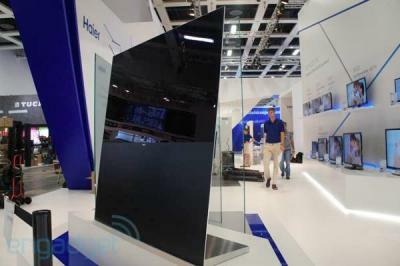 At least that was true for the beginning of 2013 when the company's CEO said that the company is in talks with Japanese TV makers for the supply of panels. About that unique design - it seems strange to me that companies try to achieve those strange design with OLED TVs. 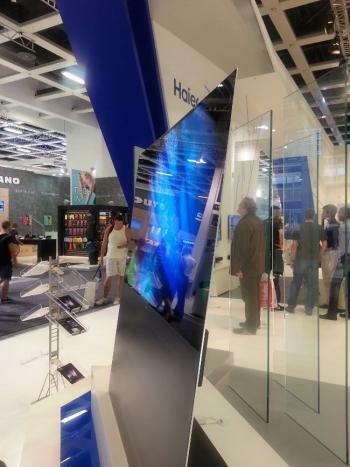 It would make much more sense to have a really thin TV that you can simply hang on the wall. Of course input ports and connections will be a problem - so maybe a wireless box with connectors? Or maybe we need HDMI, USB and other ports redesigned to a much thinner form factor. There is no need for miniaturizing ports of all interfaces. Multiple too-small ports mean unwanted lower durability of all such connections (for example, micro-USB3.0 is horrible as for durability). The problem of “too thin” TV is solvable with an external device providing all needed full-sized ports. Such device could be connected to the TV with a single cable (e.g. Ethernet one, probably with a nonstandard [yet?] mini-connector) or via wireless connection (I would prefer cable connection though, since wireless means unwanted electromagnetic radiation). So it’s indeed suboptimal to make thin OLED TV thick (or make its stand too big) just to provide enough space for ports on the TV itself. P. S. According to Consumer Reports, the external-device approach I've described is used in Samsung’s curved OLED TV.